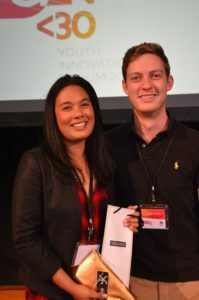 The recent RedGen Under 30 Youth Innovation Forum attracted around 30 of our best and brightest young people aged 18-30, and brought the concept of an innovation hub in the Redlands a step closer. The joint Optus-Redland City Council forum held on 7 April at the Redlands Performing Arts Centre sparked enthusiasm for a central hub where creative thinkers can seek opportunities and attract greater innovation and entrepreneurship to the city. The full-day event heard from a number of high-profile young innovators, who shared their experiences of how they turned their dreams into reality. Redland City Mayor Karen Williams said the forum was established to come up with ideas on how to keep young people in the city after finishing school. “Many of our young graduates leave the Redlands seeking greater opportunities, so we’re working to come up with ways to keep their skills, knowledge and experience here,” she said. “The young people at the forum came up with some great ideas on how we, as a community, can better support a vibrant and innovative local economy. “In addition to a possible innovation hub, suggestions included providing better work-experience opportunities for seniors before they leave school, giving young people a better idea of what their future career may be. “More P&Cs could set up a local register of firms willing to take on work-experience students, and students could be linked up with suitable opportunities. “The scheme could help establish long term ties to the area. Students with experience at local firms could go on to train in the field, ultimately returning to the firm where they started, keeping local talent in the City,” the Mayor said. The day was MC’d by home grown entrepreneur, Jordan Duffy, with speakers including former shoe designer, now start-up king Jock Fairweather of Little Tokyo 2 fame, digital specialist Ayla Soutar and marketing and communications guru Amra Naidoo. Jordan said he was excited by the calibre of the attendees at the forum. “We had some great quality ideas canvassed around people’s personal goals, and it’s great to see so many of the attendees challenging the status quo,” he said. The Mayor says Council aims to provide more jobs and improve transport so young people have more reasons to choose the Redlands as home. As well as coming up with ways to stop the ‘brain-drain’ from the Redlands, the forum provided an opportunity for young people to network and share their aspirations with others. RedGen is part of a series of forums being held to help generate innovative solutions to the Redland’s economic future. Posted in Business, Community, Council and tagged .